Sound Recordings consist of audio cassette recordings of interviews James P. Leary conducted with thirteen musical instrument makers (recorded October-December 1989) and one tape of musical performances at the Cedarburg Cultural Center made by Robert T. Teske. Those interviewed for this project included Grace and Georjann Karpek (Andrew Karpek’s wife and daughter) of the Karpek Accordion Manufacturing Company of Milwaukee, discussing the work of master father and son accordion makers Andrew and George Karpek; Ivo Baldoni and his father Alfonso (playing accordion) of A. Baldoni Music Service of Milwaukee, which hand crafted piano and button accordions and concertinas with family members in Castelfidardo, Italy, and provided restoration and repair services for accordions and guitars; Ron Poast of Black Earth, maker of Norwegian hardanger fiddles; Agate Terauds (Hugo Terauds’ widow) and her daughter Vita Kakulis of Fox Point, discussing Hugo Terauds’ Latvian kokles; Bill Schwartz of Sheboygan, manufacturer and marketer of stumpf fiddles at “The Fiddle Factory,” part of his business William W. Schwartz Associates; Ray Polarski of Three Lakes, violin maker; Louis Webster of Keshena, maker of Woodland Indian courting flutes; Ojibwa drummaker Joe Ackley of the Lac du Flambeau Reservation; Jim Razer of Tony, maker of Ojibwa drums, whistles, rattles, and jingles; Wang Chou Vang of Menomonie, maker of Hmong two-stringed violins; Miguel Cruz (with Cecil Negron, translator) of Milwaukee, maker of Puerto Rican cuatros; Konstantins Dravnieks of Thiensville, maker of Latvian kokles. 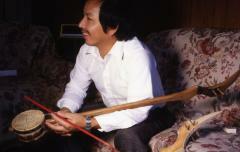 Wang Chou Vang holding a 2-stringed violin, 1989. Photograph by Lewis Koch.